When we pointed out some endangered species that are just so gosh-darn cute they'd give Knut a run for his magazine covers, we just couldn't shake the feeling that we were doing a disservice to all the rest of the world's endangered species--you know, the ones that aren't so cute. Or, in these cases, the ones that are almost downright ugly. Well, we think every creature has its own type of beauty--and we know that each holds its own important place in the eco-system--so we tracked down some of the weirder, creepier types who deserve to be saved just as much as the cuddly ones. Of the 70 species of these invertebrates--found in New Zealand--16 are considered threatened or endangered. Not much is known about the distribution or ecology of the insect, though their size has made an impression: the largest on record weighed 71 grams--about 2.5 ounces (which is just slightly more than the average bee hummingbird)--and the weta can grow to as long as 10 centimeters. But when it comes to putting up a fight, the weta don't have much to offer: They're slow, and rely mostly on an exoskeleton and preference for hiding. 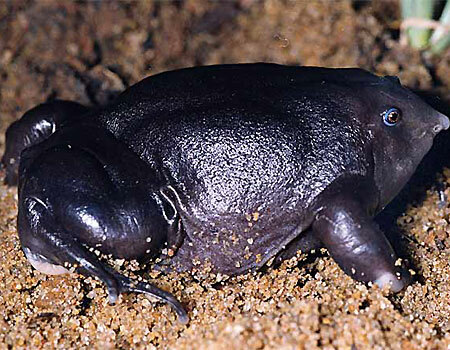 The purple frog is so rare that it wasn't even discovered until 2003, and is considered the last remaining member of a prehistoric amphibian family. Edge of Existence breaks it down this way: "These frogs were sharing the earth with the dinosaurs for 70 million years and started to evolve independently before the common ancestor of the elephant and the human." So maybe we should show a little respect to the portly purple fellows--only 135 of them have ever been seen, (though their underground lifestyle makes it hard to get an exact count) and the deforestation of their habitat in India's Western Ghats landed them on the endangered list. Whales are undoubtedly some of the Earth's most majestic creatures, but the Right whale, with its upside down face and callosities-covered head, doesn't exactly have the movie-star looks of an Orca like Willy. Still, it's one of the ocean's most endangered species with a few hundred left in the North Atlantic (and a few thousand of its counterparts in the entire Southern Hemisphere). Originally a favorite of whalers because of its slow swimming speed and resulting float after it's killed, the whales range from 35-55 feet long and weigh up to 117 tons.